The now famous police motto, “To Protect and To Serve”, was the winning slogan from a 1955 L.A Police Department contest. Those five simple, yet impactful words were the entry made by Officer Joseph S. Dorobek. The slogan has since been adopted by all police forces around our nation and it’s what police officers are sworn to do when entering into their chosen profession. If becoming a police officer is your ambition, find out all the facts and ‘how to’s’ in the following article. A police officer is a position within law enforcement. Other terms for police are cops, the fuzz, five-oh. We won’t go into the negative terms because hey, we respect our men and women in blue! The main duty of a police officer is to protect citizens and property within their jurisdiction. Police officers have a huge list of duties that come with their position such as responding to calls of both emergency and non-emergency nature, patrol their ‘beat’, warrants, arrests, tickets, court, and the to-do list goes on. Not to mention, they put their lives on the line every single day, especially now as hostility toward police is escalating. Police officer’s responsibility may differ depending on whether they work on the local, city, or federal level. If you want to be an effective police officer, you should possess some key qualities. Police departments across the nation look for candidates who are honest, ethical, hard-working, and empathetic. Police officers should have good judgement, they have to make quick decisions multiple times a day. Being physically fit is definitely beneficial to being a great police officer, not only will you need to prove yourself for entrance exams but once you’re hired, your fitness will be tested daily. Get your degree whether it’s an associate’s or bachelor’s. The degree should be focused on criminal justice, law enforcement or a related field (this is optional but recommended). The very basics for entry into the police academy is a high school diploma or GED, and a minimum of 18 years old. Because it’s competitive to gain entrance into the police academy, it could be beneficial to have an associate’s or bachelor’s degree in criminal justice or law enforcement fields. Military experience is counted as credit, as well. Having a degree or diploma will give you one leg up on competition. There is another factor that will weigh heavily in your acceptance into police academy. You will need to pass the law enforcement entrance exam and all its components, such as the physical and psychological portion, plus pass a polygraph test before being accepted into the Police Academy. The typical entrance tests given are the Compass, LEE (Law Enforcement Examination), and Asset and the jurisdiction determines which entrance exam is given. Once you’ve passed the exam, you’ll head to police academy for the next six months and, after you graduate, you’ll be working as a police officer. The cost of police academy is rather modest considering it repays with a rewarding career. The average cost of police academy is $6,500. The fees should include both the cost of tuition and any other type of cost associated with police academy such as the uniform. As with most educational costs, in-state tuition is far less expensive than out-of-state or out-of-county tuition for police academy. Some community colleges, in conjunction with local police departments, host the police academy. The amount of time spent in police academy can vary, with 6 months being the national average. WHAT IS THE LAW ENFORCEMENT ENTRANCE EXAM LIKE? The Law Enforcement Entrance exam is a pretty daunting beast due to all its components. While each jurisdiction may use a different exam, there are still similarities amongst the law enforcement exams. The written exam which will have multiple choice, true and false, and open-ended questions. With the Law Enforcement Exam Essay, candidates taking the exam write an essay in response to a prompt. Much like a resume, the Personal History Statement will give potential employers a look at your working history which will include your education, as well as work history. There will be an extensive background check using the personal history statement as their sort of road map into your life. Your physical fitness will be tested through the Physical Ability Test (PAT). This test is done to ensure you will physically be able to handle police academy. Your strength, endurance, and flexibility will all be put to the test. A hiring panel made up of police department leaders, local business people, and local government reps will interview you for the Oral Interview process. Of course, a medical evaluation will be conducted, as well as a psychological examination to make sure that you are mentally and physically healthy enough to work as a police officer. 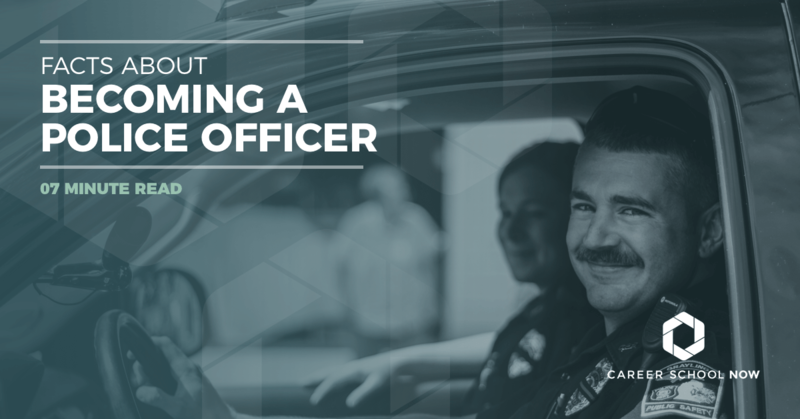 Depending on which route you take toward becoming a police officer is what will determine how much time you’ll have to invest in your training. College, depending on if you’re going for a diploma, associate’s degree, or bachelor’s degree, can take anywhere from a few months to four years (or longer, depending on if you’re not going full time). Police academy will take six to eight months and include 320-800 course hours. Factoring in on the length of time will be the state you’re being trained in. Some states requirements are not as intense as other states. WHAT IS POLICE ACADEMY LIKE? Police in training are called recruits. To be properly trained as police officers, you must attend police academy, or law enforcement training school. Each state has its own set of requirements for their law enforcement training so, depending on which state you’re training in will determine how it looks. Police academy provides the recruit with both hands-on and classroom training. Once the recruit graduates from the police academy and becomes a police officer, they must gain experience hours working alongside a senior police officer as a rookie. The Bureau of Labor Statistics reports police officers earn an average annual salary of $61,600. The police officers just coming out of police academy can expect to make an average of $34,970 while those who have been with their force for some time will earn a median salary of $102,750. Through most police departments there is a clothing allowance which is provided for purchasing uniforms. Typically there are great retirement packages offered, as well. Average occupation employment growth is right around 5%. Employment for police officers is going to experience slower than average growth at 4% through 2024. There is a wide variety of career options for police officers. Some will require you to go back to school while others are based on experience.